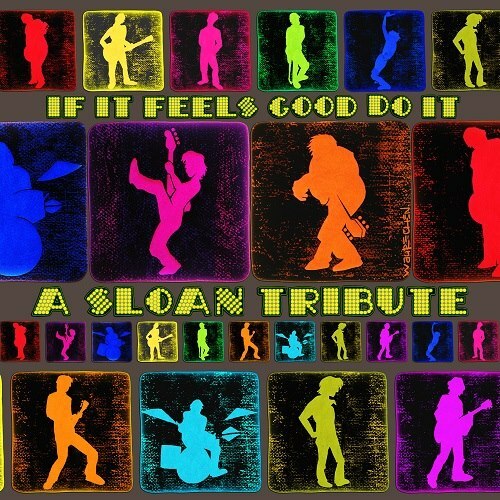 The Sloan Tribute: It Sounds Great, Get It | Pop That Goes Crunch! Various Artists, If It Feels Good Do It — A Sloan Tribute: On-line searches for “tribute albums” will yield numerous rants bellyaching about the very concept of the “tribute album.” Its kind of cool to trash tribute albums, even if the music they impart is good, or even great. Snooze. The good folks at Futureman Records have assembled a collection of thirty-one covers of some of the finest songs released by the Toronto-based quartet, Sloan, over the course of their two+ decades of releasing consistently tasty works of melodically based rock ‘n’ roll. Call it Power Pop, if you like. Indeed, many of the contributing artists to If It Feels Good will be quite well-known to visitors of this site. Many have placed high on my lists of the best songs, LPs and EPs over the past three years. Undoubtedly, one approaches an album such as If It Feels Good from an inherently biased perspective based on one’s assessment of the source material. My personal collection counts more than 150 tracks by Sloan. I would be predisposed to enjoying If It Feels Good. Never mind, though. Futureman has succeeded in releasing the finest tribute album I have heard. The collection is expertly curated and assembled, down to the artwork which is reproduced at the top of this post. The performances on If It Feels Good are, without a fault, first-rate. The interpretations of tracks from Sloan’s large catalog are thoughtful and remain, with one exception, generally “true” to the originals, even while the artists put their own spins on the soundscapes. The recording, production and mastering are superb throughout, and glue the collection together into a cohesive whole. If It Feels Good is more than worth your valuable time and money. I could easily write about each of the thirty-one tracks on If It Feels Good. There is not a duffer in the bunch. I’ll focus, however, on some of my favorites. Stereo Tiger, which grabbed the number 7 spot on my list of the best longplayers of 2015, kicks off the festivities with a nice version of “C’mon C’mon,” that is slightly brighter than Sloan’s original. The drums also kick in a bit stronger and the vocals, like most on the collection, shine throughout the track. “Misty’s Beside Herself” ranks as one of my favorite Sloan tracks. Paul Myers adds electronics to the track, and pulls it off brilliantly. Phil Ajjarapu contributes a nice version of “Set In Motion” to the collection. Head Futureman, Keith Klingensmith, shines brightly on “I Wanna Thank You.” A track from my Number 1 EP of 2015, Andy Reed’s version of “I Love A Long Goodbye,” also appears here, and is, of course, essential. Will you find yourself firing up If If Feels Good, and listen to start to finish? Maybe, maybe not. At the very least, stick the thirty-one tracks into a big playlist, hit shuffle, and marvel at the great skill, care and love devoted to covering some of the finest songs released by one of the best bands of the past two decades.